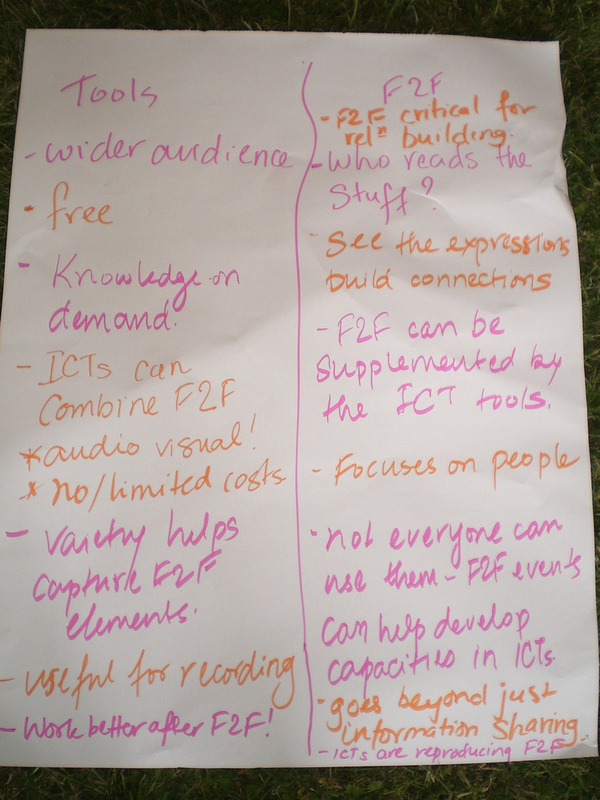 Share Fair Addis: Fishbowl and fishbowl battle | Agile KM for me… and you? O(h) now I know how to use the Fishbowl methodology in another way. The Addis Ababa AgKnowledge Africa ShareFair (1) has just started and on this day 0 (2), a host of training sessions have been organised. Together with the KM4Dev group (Charles Dhewa, Gauri Salokhe, Roxana Samii, Pete Cranston) I am fighting for a cause that looks like a vintage toy store against the whistles and bells of a Wii or the latest Android games: Next to the hyped-up Mendeley and Google sessions, aside from the ever popular blogging, video and audio sessions, we are showing the power of good old face-to-face knowledge sharing methods. Among these, Gauri and I are presenting the ‘fish bowl‘ (not fish ball mind you, as you may see on the AgKnowledge ShareFair pictures for a joke). I pushed Gauri to insist on presenting this method and she got unluckily voted for when we selected the KS methods we’d show today so here we are, presenting the Fishbowl method (sorry Gauri ;)). With 6 participants to start with we don’t quite see the point of starting a full-on fish bowl – so Gauri presents her twisted version: Fishbowl battle (my suggested name for it). What’s different? Instead of the typical 4-5 seats in the middle for the talking participants, here it’s a one-on-one debating the pros and cons of xyz. Participants outside the duelling duo tend to take one side and when they want to enter the battle they gently tap the shoulder of the duellist – civilised fishes we are! To demonstrate this fishbowl battle, we take a silly topic to duel on: ICT tools are better than face-to-face KS approaches. The discussion unfolds and arguments come one by one, as participants take their turn at the duelling seat. It’s working, even though we stop after 20 minutes of discussion: n0 awkward lonely moment for the duellists – the cavalry was always there to replace them – and we get some results as you can see below! The limited time and size of the group do not give us an opportunity to sit through a more typical fishbowl exercise. In the debrief with our participating colleagues, we find out that either the topic we chose was not to the point (very likely) or that it does not seem so obvious to use fishbowl battle because we may not feel like supporting just one side. We’re complex fish, we have a complex view about it! Anyway it was good to try it out in this format. Thank you Gauri for the inspiration! You may want to have a standing outer circle to avoid outer participants to fall into sleep. 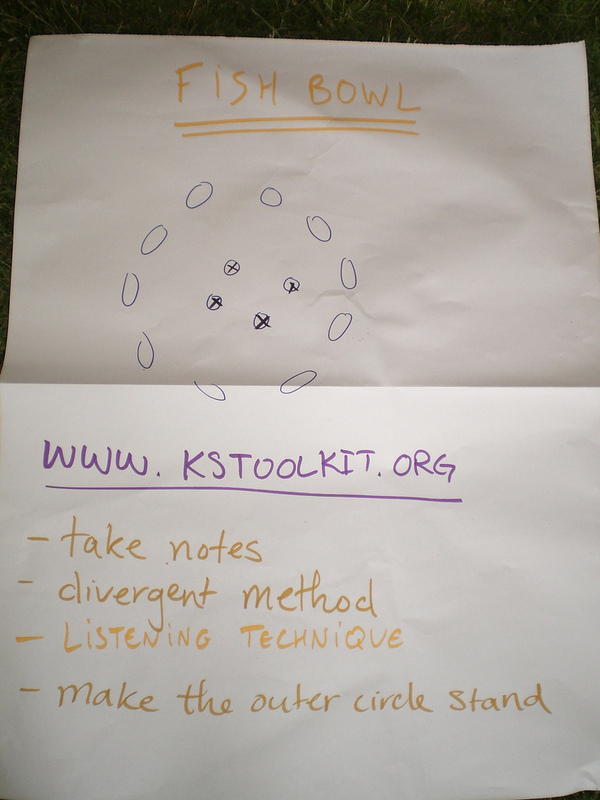 This method, some alternatives to it like the Samoan circle and more F2F methods are available on the Knowledge sharing toolkit – exactly here. (1) AgKnowledge Africa is organised by the CGIAR, FAO, IFAD, CTA, IKM-Emergent and KM4DEV. (2) Day 0 of the Share Fair has been baptised ‘Oh now I know how’ day to emphasize the training. This entry was posted in Facilitation, KM4DEV, Tools & approaches by Ewen Le Borgne. Bookmark the permalink.